Home > B.P. Enright > Post-Enright Bros.
After the Enright Bros. photo gallery closed very little information is available about Barney. However, the business card he used in 1914 indicates that he is still dabbling in photography and is selling health and accident insurance on the side. 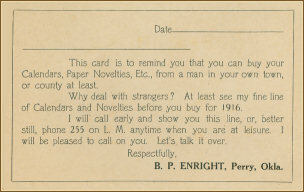 One of the most interesting advertising items to survive the passage of time is this fold-out postcard. A few photographs are available from this period.